SAINT MARY-OF-THE-WOODS—Who is the artist and who is the work of art? That is a question at the heart of Teresa Clark’s journey of faith. Yet during that same time, it would seem that Blessed Mother Theodore and God have both been refashioning Clark. 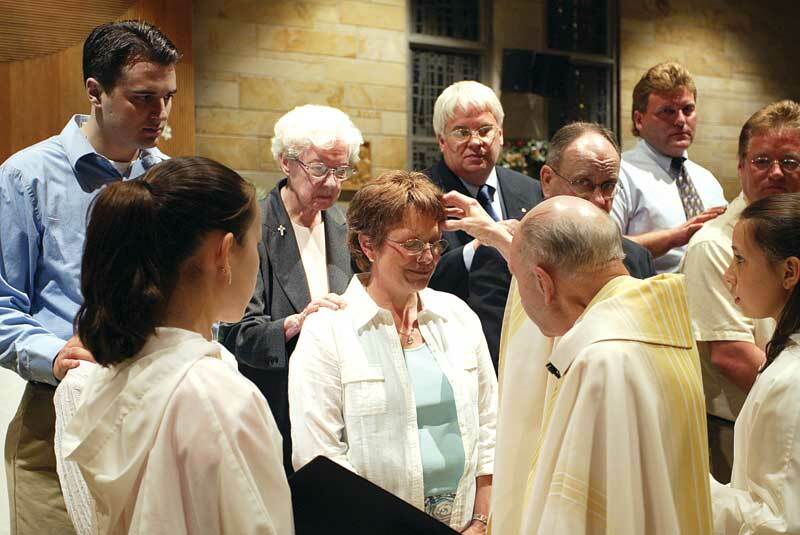 Since her arrival in Terre Haute in the spring of 2005, Clark, who had attended a Mennonite church as a young adult but had never been baptized, came to a deep appreciation of the Catholic faith that was the bedrock of Blessed Mother Theodore’s life. 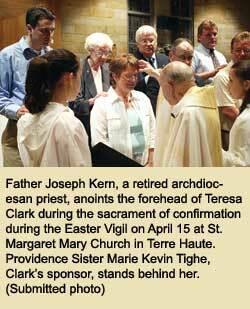 This appreciation grew so much that Clark, 50, participated in the Rite of Christian Initiation of Adults (RCIA) at St. Margaret Mary Parish in Terre Haute, then was baptized and received into the full communion of the Church at the Easter Vigil on April 15. The next day, she attended Easter Sunday morning Mass with the Sisters of Providence. During that liturgy, she gazed at a portrait of Blessed Mother Theodore that hung in the church and thought about all that had happened to her. Clark first learned of Blessed Mother Theodore and the Sisters of Providence in 2000. There was a possibility that she might create a statue of Blessed Mother Theodore for a cemetery in Fort Wayne, where she lived at the time, so she came to Saint Mary-of-the-Woods to learn about her and the community she founded. Clark spoke with Providence Sister Marie Kevin Tighe, the vice postulator of the canonization Cause of Blessed Mother Theodore, read some of the foundress’ writings and met several members of the community. After the original commission fell through, Clark faced her own battles that involved a difficult personal relationship, financial challenges and maintenance problems with her house. When all of this climaxed in 2005, the possibility of creating a statue of Blessed Mother Theodore resurfaced. 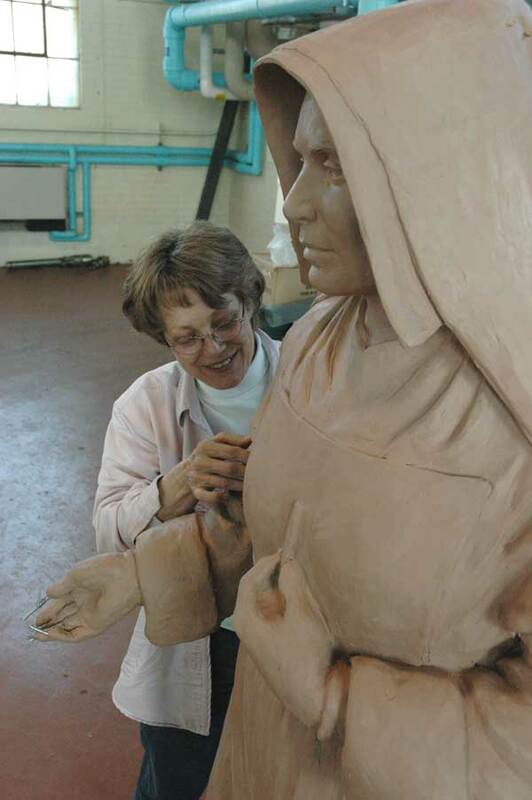 The Sisters of Providence were arranging with officials of the Basilica of the National Shrine of the Immaculate Conception in Washington, D.C., for the placement of a statue of Blessed Mother Theodore in a garden next to the shrine. Sister Marie Kevin approached Clark about the commission, and she accepted. With that choice made, Clark noticed that the problems that had been bogging her down began to be resolved and her move to Terre Haute was trouble-free. All these events she in part attributed to the intercession of the woman whose likeness she had been asked to create. While Clark believes that Blessed Mother Theodore may have been praying for her, she also learned much from the example of her life. A few months after moving to Terre Haute, Clark started her participation in RCIA with Sister Marie Kevin serving as her sponsor. As she continued to mold hundreds of pounds of clay into the form of Blessed Mother Theodore, her own life of faith took on greater shape. Sister Marie Kevin, who has been a member of the Sisters of Providence for 64 years, said she has gained a greater appreciation of her community’s foundress through Clark’s artistry. Clark’s time working on the statue and in RCIA has helped her understand her journey of faith that she described as “the most profound experience I’ve had, barring the birth of my children. “I feel a lot of what holds people back in faith are the little walls that they put up themselves,” Clark said. “God is always around you. You just somehow don’t respond or relate or see. For her own part, Sister Marie Kevin said that her relationship with Clark has been a “quiet influence” over the past year, helping her come to a renewed appreciation of her faith. 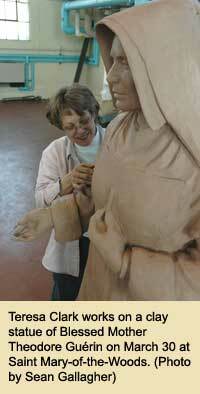 Clark will soon complete her clay statue of Blessed Mother Theodore. After officials from the National Shrine approve it, a fiberglass mold of it will then be made and sent to a sculptor in Ohio. He will follow Clark’s work minutely as he makes the final limestone version. Clark hopes that the image of Blessed Mother Theodore that has had such a deep impact on her life will touch others in a positive way.